This review was originally posted on the More Than Mommy blog. Click the link to visit her blog. Below is her review of Monkisee DVD Collection. MonkiSee, Monki-do, I Like Learning, How About You? 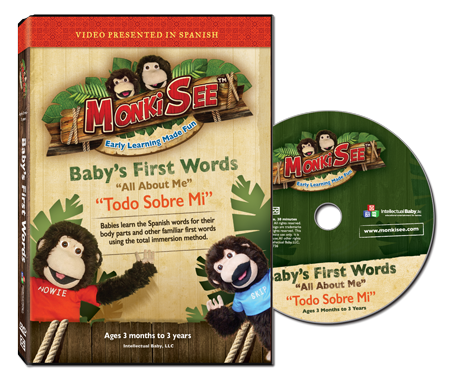 MonkiSee is a company that makes a variety of DVD’s made for babies age 3 months to 4 years. They sent me their fabulous collection to review. These DVD’s were formulated as a means to take advantage of the extraordinary ability of babies to learn. By working with your baby, the idea is that you can use these videos to teach them to read. This does not come easily, however. It is important to sit with your child, engaging them while watching the video, and pointing to or holding up items that the DVD is talking about. Howie and Skip are the main characters in each movie. What makes them interesting is that they are monkeys, who are also brothers. 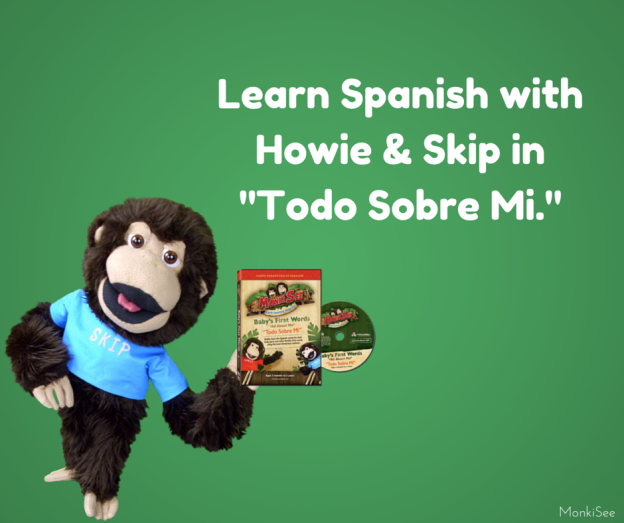 Howie does his best to teach Skip to read and about different topics, like shapes, letters and colors throughout each movie. I particularly like the fact that Howie is so loving and helpful to his little brother monkey. Too often, I see children’s media that encourages fighting and arguing between siblings. MonkiSee encourages cooperation and love between children. There are seven movies as part of the main series. This DVD is made for baby’s age 3 months to 2 years. Topics include body parts such as fingers, toes, noses, tongues, and everything in between as well as the things related to babies, such as diapers, pacifiers, bottles, etc. With each new topic, the word is flashed and it is the parent’s job to point to the body part and repeat the words. Ideas are communicated with a variety of puppets, animals, older children, rhymes and singing. This is my 8 month olds favorite of the set. She sat almost mesmerized, watching every detail. All of the basic colors, such as red, orange, yellow, green, purple, blue and many more are covered. Some that you don’t see mentioned in other children’s media are indigo, rainbow, grey, silver, and gold. I love that this covers so many colors. While my older daughter knows all of these colors already, I really think that something like this would have helped her to learn some of those others earlier and they will certainly help my baby to learn them sooner as well. Obviously, this movies focus is on teaching shapes. The shapes focused on are: Circle, square, triangle, rectangle, oval, diamond, heart, hexagon, pentagon, octagon, star, and crescent. Howie and Skip point out shapes in everyday things that children would recognize. Rhymes, songs, and everyday items are used to convey the idea of different shapes. I like that this video is different from others of this type, in that they go beyond the basic four or five shapes. My 5 year old, Shari, had a lot of fun with this DVD. She enjoyed watching and playing along, demonstrating crawling, walking and jumping for her little sister. My 8 month old enjoyed the clips of the kids doing the actions. As with all of the movies in the collection, each word is presented, discussed, and some of them even have songs, which both of my girls liked. This DVD focuses on things around the house, especially things in the kitchen, foods, and pets, things in a child’s room, clothing, cleaning and so much more! The great thing is that your child will recognize every item that is presented. This is a really fun one. My 5 year old enjoyed looking at the animals and learning to read some of their names while watching this. My 8 month old, Sophia, largely ignored this one, though I think she will find it of much more interest when she is a little older. Some animals included are: Horse, cow, cat, pig, sheep, etc. Another thing that my older daughter liked is that there were some interesting facts included, such as: Did you know that dogs can hear up to 4x as far away as humans can? This DVD goes through the alphabet, letter by letter. I liked that many different things are listed for each letter, whereas many kids’ media only chooses one. Some of the words listed, like guava and iguana, got my older daughter asking questions, wanting to learn more, which is great for expanding her vocabulary and instilling a love of learning. Another great thing about this movie is that it uses uppercase, lowercase, and different fonts to show the letters, which makes it easier to recognize later. 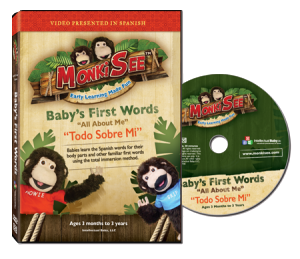 My takeaway from these DVD’s is that they are a great resource to teach your baby to read IF you are willing to spend some time each day watching them with your baby. If you aren’t willing to do that, then they do still make good videos for entertainment purposes and your children probably would still pick up some of the preschool basics, like shapes and ABC’s. These go into more depth than some other DVD’s marketed for babies and very young children, which makes them better, in my book. One very popular set of baby DVD’s are Baby Einstein, we even have a couple. MonkiSee FAR outshines them in every way. If you have been looking for something like this for your little one, you can check them out HERE. They carry many products, including flash cards, books and more, all designed to for teaching your baby in the best possible way. You can connect with them on Facebook, and find out about their other products on their website. This entry was posted in Uncategorized and tagged monkisee review on October 6, 2013 by Krista G..